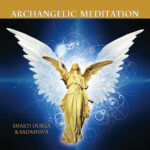 Feel the love, bliss and a deep connection with the Archangels as Shakti Durga sublimely sings this mantra. Access the realms of the angels and feel the Archangelic presence. Allow the mantra to open your heart and deepen your connection with the Archangels.